After looking at several venues to hold our daughters wedding reception I seemed to always find and issue with something. Then I made a visit to the Essex Room, I met Norman and Ned and everything Changed. Ned provided samples of some appetizers that won us over. Normans friendly personalty and great ideas sealed the deal. By the time we left that night we new that this was where the wedding would be. As time went on and the planning continued we were amazed how not a single detail was overlooked. The entire staff at the Essex Room became part of the planning process, they made us feel as if the wedding was as important to them as it was to us. It was a wonderful the day went off without a hitch. Loved every minute of the day. Our guests are still talking about the venue the food and fun had that day...Also our after party in the Lobster Trap Pub was a great finish to the best day ever......Thanks, Norman, Ned, Donna, Maureen, Lauren. and all the rest of the staff. Great! Would use them again! Awesome experience! Fun time! Essex Room was very accommodating and responsive to all our needs. Would use them again! We knew we wanted to have our wedding at The Essex Room as soon as we saw it. It is a beautiful space, with beautiful views. Lauren was great to work with through the whole process. She helped us through all our questions during the planning, and made sure the wedding day went smoothly. And the day was perfect! The food was awesome, the room looked amazing, and we got lots of great feedback from our guests. I am so glad we chose The Essex Room for our wedding! My husband and I had our wedding at Essex Room during September and it couldn’t have been a more amazing experience! Donna and Lauren walked us through the entire process and answered our hundreds of questions. They made sure the day was perfect! We had our after party in the Lobster Trap which added a unique touch. Guests loved it! The next day we hosted a lobster bake looking over the marsh, catered by Woodmans. All the food was amazing. It was truly a perfect weekend. Thanks Ali! It was our pleasure to host your wedding weekend events. You gave your guests a fun filled weekend and we had so much fun helping you plan it. My husband and I fell in love with The Essex Room from our first visit of the venue. Not only is it located on one of the most beautiful spots in the Northshore, the feeling we got from staff and Woodman's family was like nothing we felt at any other venue we visited. Maureen, Donna, and Lauren were integral parts of making our wedding day the most perfect for us! They ran our event seamlessly and offered suggestions and tips that would help to make our day a dream come true. They honored all of our requests and there was nothing we asked of them that they didn't do. The highlight of our wedding day was the ease of having our ceremony, reception, and after party (at The Lobster Trap) all in one location so our guests did not have to travel. The appetizers, meals, and desserts provided by Chef Ned were absolutely divine and so beautiful presented to our guests. The staff at The Essex Room welcomed us into their family and made sure that our wedding day was everything we could have dreamed of and more! The perfect spot for a day filled with so much joy and love! We had our ceremony on 06/09/18 outside in the small garden area overlooking the marsh with 24 guests, a family meal after the ceremony downstairs in the Lobster Trap Pub and then a cocktail reception for 130 guests in the upstairs function space that included passed & stationed hors d'oeuvres and desserts. One of the biggest draws for us to this space was that we could do everything in one location and not have to move the ceremony guests from place to place. The upstairs was decorated beautifully with the mixed combination of pictures, flowers, centerpieces & candles that we brought in with the existing decor of the room. Donna and Lauren coordinated and managed every detail, helped with decisions, made suggestions and were so helpful in ensuring that everything was perfect and stress free for us on our wedding day, it was clear we wouldn't have to worry about a single thing! All of the staff we encountered were incredible, so friendly, welcoming and accommodating. They also seemed to want to make sure our day was perfect for us. THANK YOU Donna & Lauren for making me feel so special and catered too. You answered every email / question / or change to our plan politely and in a timely manner, shared your suggestions on how to achieve the feel we were hoping for and never made me feel I was asking too much. Your personal attention to every detail was reflected in how beautiful the day was and you made our day everything we could have hoped for and more!! I would highly recommend Donna, Lauren, Chef Ned, Maureen and the entire team at The Essex Room!! You will not be disappointed by the level of experience, beautiful grounds, amazing food and outstanding high quality level of service you will receive from this group - they know what they are doing and it shows in the level of attention to detail that you will receive. I loved the Essex Room from the minute we visited and tried their food. The prices were reasonable and staff was always available. Not to mention the dance floor is huge. Thank you for taking the time to share your thoughts with couples looking for a venue on the North Shore. We are so glad that we chose The Essex Room for our wedding! 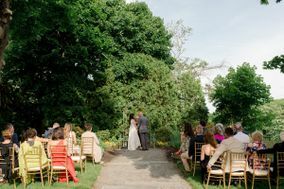 To start, it is in a beautiful and convenient location with plenty of parking, set on the Essex River with lovely grounds for an outdoor ceremony. It is right in the heart of Essex, but set way back so it feels very private. The function room is beautiful with a big dance floor, a spacious bridal suite and a very cool bar and lounge. The food was exceptional and the guests were raving about it. As part of the wedding package, they also provide a wedding planner/coordinator to really help you work through all of the details, manage the menu, coordinate with the other vendors and work through the schedule which was so incredibly helpful. I would have been lost without them as they really worked hard to make sure my event was exactly how I envisioned and they succeeded - Everything was perfect. The Essex Room really offers a great value for the price and their entire staff is fantastic. I highly recommend The Essex Room to any couple looking for a wedding venue on the North Shore. Thank you Sarah for taking the time to write such a glowing review. It was a pleasure to work with you to create such a beautiful wedding and memorable day! The Essex Room was an amazing choice. It completely exceeded our expectations. Everyone working there was kind and always willing to help with anything. Lauren and Donna were extremely personable and made our experience wonderful. The food was beyond good and the cook is an extremely friendly person. You will definitely not be disappointed if you choose the Essex Room as your venue and I would highly recommend it to anyone. Thank you for your kind words, Jennie. It was our honor to be apart of your special day! Wishing you and Ryan best wishes as a newly married couple. Working with the Essex Room was one of the best choices we made. We were so thankful to find an awesome venue that was actually in our budget. You'd think the views of the marsh would have been the biggest draw for this venue, instead it was the amazing team (The views were just a bonus!). Our wedding day was absolutely perfect and it was 100% because of the assistance, planning and coordination of the Essex Room team. We mostly worked with Donna and Lauren and they were delightful. Also of note: Chef Ned and his food are absolutely outstanding. His dedication to his craft is evident and we got so many compliments on our choices. I honestly still dream about my wedding food and I don't foresee that ending anytime soon. Brittany thank you for your kind words of appreciation. You and George were a wonderful couple to work with and we were honored to host your wedding. We all wish you the very best! My experience at the Essex Room was amazing. They were extremely helpful the day of the even and they were always available to answer my questions beforehand. I could not have picked a better venue to throw my friends bridal shower at. I would do it again, at the Essex Room, in a heart beat! Thank you for an amazing day! We could not have imagined a more perfect day! The venue was amazing, the staff superb and the food out of this world. We have been told by all of our guests that it was the best wedding they had ever been too! We are so happy and thankful the the entire Essex Room staff for making our day everything we ever dreamed and more. Thank you for your kind words, Lauren. It was our pleasure to be apart of your special day, which it truly was special. Best wishes. The entire team at The Essex Room was outstanding to work with!! From our initial meeting with Faye, through the entire planning process with Donna and Lauren. We honestly could not have asked for more or dreamed of a more perfect reception. PS... the food was exceptional! Our guests are still talking about it. Thank you Mary. We send you both happy holiday wishes as a married couple. If you want great value plus really top-notch staff and extraordinary food, look no further than the Essex Room. We had a great experience and our guests are still raving about everything, and will for a very long time. We are thrilled we made this choice, and could not recommend the Essex Room with greater enthusiasm. Thank you for helping to put our wedding "over the top." We love you. We loved working with everyone at The Essex Room and the food was AMAZING! Thank you Amy! We loved having you here and being part of such an important and personal event. We all wish you and Brian and happy holiday as a married couple. Living in Texas and planning a New England wedding can be a bit of a challenge. I sent inquiries to multiple venues, all beautiful, We selected The Essex Room after a conversation with Maureen Woodman followed by a tour of the venue and the outside area. Maureen was the only person who actually called me within an hour (on a a Sunday, no less) to talk about my vision for the wedding. We first met with Faye Broderick which reinforced that we selected the right venue as I knew we were in great hands for making sure every detail was covered. In addition to Maureen and Faye, Donna Roy, Lauren Muise, Norman Lemcke and Chef Ned and the rest of the staff are INCREDIBLE. Donna was extremely responsive to my numerous e-mails and they were easy to work with to schedule to tours of the venue for a variety of vendors (florists, photographer, our officiant, etc.) for times that I was in Massachusetts. Donna and Lauren checked & double-checked all the details and coordinated / executed everything professionally and perfectly on our wedding day. They set everything up just the way we wanted with the centerpieces we brought in, didn't have to worry about anything. Norman is fun and personable and great with postings and updates on social media and a willing dog handler if you want to include your furry friend in your wedding ceremony. (Bear, our 135 lb. Mastiff, has few manners and drools on everybody so he did not participate in the ceremony, to my and Norman's dismay! ;-) This was the right decision by my husband, btw!) The ceremony on the manicured lawn was lovely, the bar service for cocktail hour and reception was terrific & the food was amazing. Our guests rave about every aspect: from apple cider donuts pre-ceremony to passed hor d'oeuvres & cheeses to clam chowder & mouth-watering filet / chicken / risotto served for the main course. Chef Ned is very talented in the kitchen and our guests LOVED talking to him about the cheeses and other menu items. Highest recommendation! My husband and I cannot praise The Essex Room enough! We planned our wedding in 90 days - 90. Days. And we could NOT have done it without the amazing team at The Essex Room. Secondly, they were incredibly flexible with our meager budget. Some venues didn't even want to meet with us because of our budget, but The Essex Room made us feel valued and helped us have the wedding of our dreams without overspending! They also provided top-quality referrals for vendors, and honestly they just handled every single detail so we didn't have to! They went above and beyond with decorations - hand-crafted pinwheels and tassels in our colors, outdoor decor for our cocktail hour, etc. Our day went perfectly and we didn't need to stress about a single thing. We feel so blessed to have found The Essex Room - visit once and you'll feel the same way. Thanks Magen! We had such a great time working with you. Thank you for making us part of this very personal and special day. Enjoy your holiday as man and wife. Please send our best to your parents (Glo and Ed) and wish them a happy holiday from us. P.S. Tell Glo that Norman still talks about how much fun he had with her. My husband and LOVED the Essex Room when we visited, not because they gave us food and lemonade, but because of the personal attention we received throughout our planning process and day of the wedding. We worked with most of the staff there: Lauren, Donna, Faye, Maureen, Norman, even Chef Ned and they were all fantastic. They even accommodated a request we made 5 days before the wedding. Everyone there had an eye for details, especially Lauren and Donna, who creatively used our decorations in a way I didn't even think of. We had our ceremony and cocktail hour outside and since the weather cooperated we had the most beautiful background, though the outside area is small, photographers know how to work the angles to make the parking lot disappear. From the food to service, everything was perfect, and our guests kept raving about the food! We can't thank the Essex Room enough for hosting our perfect day! Donna Roy and her staff were incredible. I asked for a few changed like moving of a swing and and archway and they did it without any questions asked. At one point during the evening my bustle fell down and a staff member was there to get it secured in place. There was never a time I felt like I couldn't call with a question or concern. I loved working with the Essex Room. They brought a family feel to our weeding that we wouldn't have been able to get anywhere else! Thank you, it was such a pleasure being a part of your day! Happy Holidays and and best wishes for the New Year! The Essex Room was the first venue my husband and I visited. After visiting them, we compared every venue to the Essex Room. The staff was warm, welcoming, friendly and so flexible. Donna and her team handled anything that came up with incredible professionalism and Chef Ned (and his food) was amazing. They treated us like we were a part of the family. The staff at the Essex Room made our wedding day the best day of our lives. Thank you for the kind words Samantha. It was an absolute pleasure working with you and we were so honored to be part of such a special day. I can't say enough good things about the people who work at the Essex Room. Donna, Norman, Lauren, Chef Ned, and others just made sure the day went perfectly. Weather was a major concern for me, and Donna went out of her way to help me feel comfortable if we had to do either option. She went out of her way to help me with various small details to plan for both, and was so great about being organized. The day went smoothly thanks to the team wrangling my friends and family, and EVERYONE is raving about the food - Chef Ned really out did himself! Everyone who worked there wants the day to feel personal to you, and was flexible about making that happen. The venue itself is BEAUTIFUL, and we got some great pictures. Overall, I am SO happy I went with the Essex Room, and am looking forward to booking another event there in the future! Be sure you are ok if weather does not cooperate!!! My fiancée and I were looking for a relaxed but beautiful place to host our wedding, and after seeing the Essex Room and meeting with the staff, we knew it was the right place for our reception. Donna, Lauren, Chef Ned, Norman, and Maureen were all enthusiastic and a pleasure to work with. They kept us on schedule and on track so that none of the big or little details were missed. We had a beautiful and fun wedding that our guests enjoyed, and we knew we were in such good hands, we were able to relax and enjoy our reception. Thank you to everybody at the Essex Room that made our wedding a wonderful event! Our wedding date is soon approaching and we couldn't feel more at ease than with the Essex Room team. They have been simply great all along the way. The food options at our tasting confirm we will have the best food at any wedding. The entire team has been super friendly, accommodating, flexible, helpful with reception and ceremony ideas and overall welcoming. We truly feel that us and our wedding day matter to each of them and we aren't just another couple getting married at their venue. I read a review posted here in Wedding Wire when we were deciding on which venue and someone mentioned that the people of Essex Room is what made it so great, and I couldn't agree more! I can't wait to see how the entire day unfolds!! !